Census Data Will Reshape U.S. Political Landscape The 2010 census shows America's population growth dropping to the lowest level since the Great Depression, with a steady migration of people to the South and West. The shift will be a boon to Republicans as GOP-leaning states such as Texas pick up new House seats. States in the South and West gained residents — and political clout — at the expense of the Midwest and East, according to new census figures that will change the nation's political makeup. The 2010 Census Bureau report, released Tuesday, officially put the U.S. population at 308.7 million, reflecting the lowest growth since the Great Depression. Texas and Nevada led the way, reinforcing a decades-long shift away from the traditional manufacturing belt and toward warmer regions of the country. Click the map to see which states experienced the largest population shifts over the past decade. Only one state, Michigan, lost population during the past decade. Nevada, with a 35 percent increase, was the fastest-growing state. The 2010 census marked the 23rd national tabulation since the first constitutionally mandated count in 1790. In that year, the U.S. had a population of 3.9 million people, most of whom were concentrated along the Eastern Seaboard. The newly released data set in motion the reapportionment of the 435 House seats among the 50 states — a high-stakes process that will redraw the election map for the next decade. The changes recorded in this year's census were expected to play into the hands of Republicans, with GOP-leaning states gaining the most seats and many Democratic strongholds, such as New York, losing. But shifts in the numbers of minorities might even things out politically, experts said. 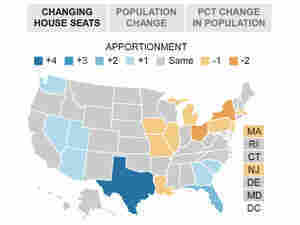 Texas, with a population growth of 20.6 percent since 2000, will gain four new House seats, and Florida will gain two. Gaining one each are Arizona, Georgia, Nevada, South Carolina, Utah and Washington. Florida will now have as many U.S. House members as New York: 27. California -- which will not gain a House seat after a census for the first time in its history -- will still have 53 seats, and Texas will climb to 36. "The surprises in the new data are that Michigan lost more than expected and Texas and Nevada are both growing more than the projections," said Lisa Neidert, a senior research associate at the Population Studies Center at the University of Michigan. The lone Southern state on the losing end of the population reshuffle was Louisiana, as a result of Hurricane Katrina in 2005, Neidert said. She called such a shift due to a natural disaster "unprecedented in the U.S."
The general shift from Democratic-leaning "blue" states to Republican-dominated "red" states was anticipated, but the Obama administration said it did not expect the new census figures to have a "huge practical impact" on national politics. White House spokesman Robert Gibbs said he didn't see any reason why both parties would not remain competitive in the South and West. "I don't think shifting some seats from one area of the country to another necessarily marks a concern that you can't make a politically potent argument in those new places," he said. Neidert said while much will be written about a seismic political shift, "the fact is, if you look at the demographics, a lot of blue people are moving to those red states." William Frey, a demographer at the Brookings Institution, agreed, noting that "these states can change in population, but the populations themselves may change voting patterns." Immigration accounted for a smaller portion of the overall population increase, partly because of a "pretty bad decade" in which the country's economy saw a severe economic downturn, Frey and others agreed. Internal migration is the political "game changer," said Kenneth Johnson, a senior demographer at the Carsey Institute at the University of New Hampshire. "Unlike natural increase and immigration, domestic migration is a zero-sum game -- if one state gains, another loses," Johnson said. "So without a significant domestic migration gain, it is unlikely that a state could gain a seat." Although census data that include information on race or ethnicity will not be released until February, Johnson said there's little doubt from earlier estimates that minority populations -- especially Hispanics -- are driving changes in the makeup of the population. "Hispanics were a particularly important factor in population growth accounting for nearly 51 percent of the overall U.S. population gain, though they represented less than 16 percent of the U.S. population in 2009," he said. Michael McDonald, an expert in voting and redistricting at Brookings, said that Hispanics account for much of the population growth in Texas and Florida. As a result, he said, Republicans "could be constrained on what they do with the new seats." The release of state apportionment numbers is the first set of numbers from the 2010 census. Louisiana, Virginia, New Jersey and Mississippi will be among the first states to receive their redistricting data next February.